a vacation spent in one's home country rather than abroad, or one spent at home and involving day trips to local attractions. Staycation, it’s a word often misused. We tell friends we had a staycation when really we lived our normal life inside our home, maybe with more Netflix and less pants. But a staycation is supposed to be a true vacation from the everyday, just not as far from home. 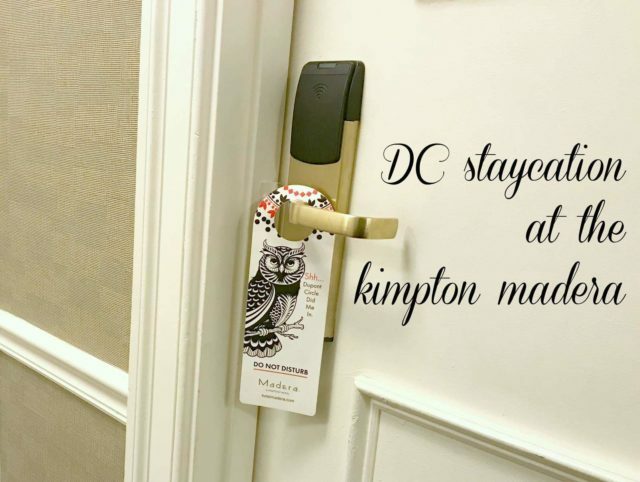 For Karl’s birthday, he wanted a Washington DC staycation and we had the perfect weekend getaway at Kimpton Hotel Madera. There aren’t a lot of hotels with balconies in Washington DC, and most are either super duper fancy or a bit sketchy. I drive past the Kimpton Hotel Madera many days on my way home from work and have dined at Firefly, the restaurant in its lobby. I know it’s well-appointed, convenient, and stylish. 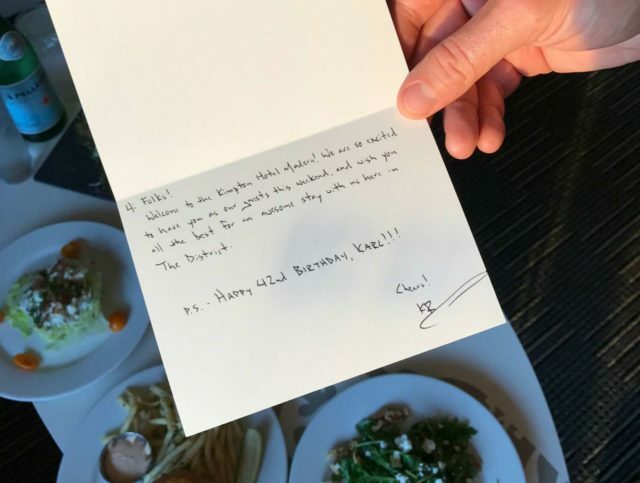 And being part of Kimpton, I know the service and amenities would be top notch. I reached out to Hotel Madera and they offered to host us for Karl’s birthday weekend. The weather at the end of September and beginning of October is spectacular in the DC area, and our quick 20 minute drive Friday to the hotel was enjoyed with the sunroof open and Spotify playing. I took off the second half of the day and we arrived at the hotel a bit after check-in time. The Madera has valet parking, or you can choose to self-park in a public garage in the vicinity. 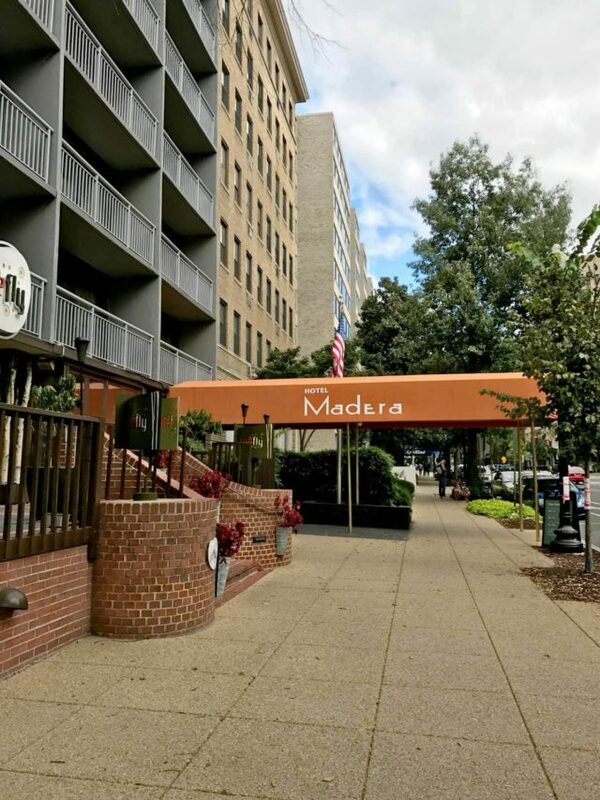 The Madera is also a quick walk from the Dupont Circle Metro station. We entered the cozy and stylish lobby and were greeted by genuine smiles from all the staff. Kimpton Madera set us up in one of their King Deluxe rooms with a balcony. While there’s few hotels in DC that have balconies, this hotel has them for all rooms that face New Hampshire Avenue. The room was stylish and modern yet comfortable, very spacious with over 400 square feet including a living area with couch, chair, and coffee table and cool modern art commissioned for the Madera. 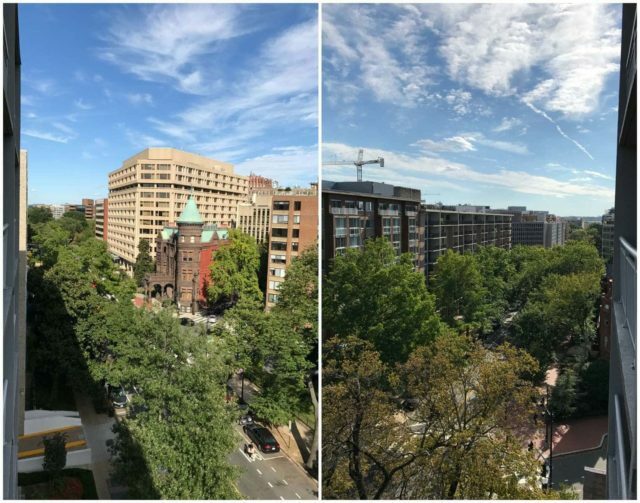 Kimpton Madera is on New Hampshire Avenue, which connects to Dupont Circle, one of the most vibrant parts of DC. Go to the right, and you hit office buildings a business district. Turn left, you hit amazing dining, shopping, and DC life. Walk a few blocks and reach the White House and other popular tourist attractions. Yet all around you are row homes and apartment buildings. It’s a pretty cool experience, especially since most hotels in metropolitan cities are in touristy areas or business districts. You can really get the feel of being a DC resident while having everything at your fingertips. A great way to see the area is borrowing the charming PUBLIC bikes that Kimpton Madera offers; with its location you can comfortably ride on a weekend without a ton of traffic and see all that our Nation’s Capital has to offer. 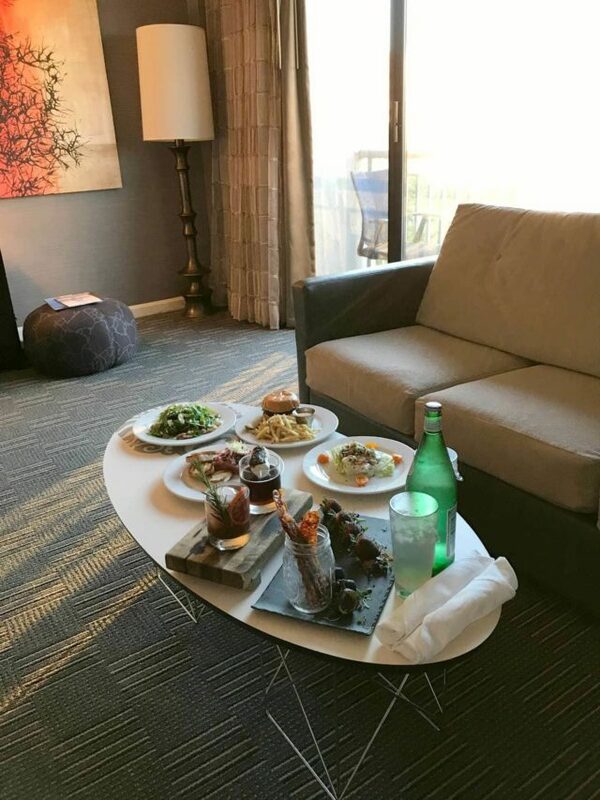 Room service at Kimpton Madera is provided by Firefly, the highly rated restaurant next door. Karl ordered the wagu burger, I got the wedge salad and beef tartare. Kimpton Madera was sweet enough to add to our order two amazing cocktails and a tray of candied bacon, chocolate covered strawberries, and blue cheese-stuffed figs and a personalized note to my husband. All of the food was utterly phenomenal. The Madera also has a wine happy hour from 6-7 every evening in their lobby; in the morning the lobby has coffee and tea service from 6-10. The lobby is cozy and welcoming, a place where guests are sitting, sipping coffee and reading the paper. One morning we took a copy of the Washington Post from the lobby and went outside to read while enjoying our coffee and the gorgeous pre-fall weather. 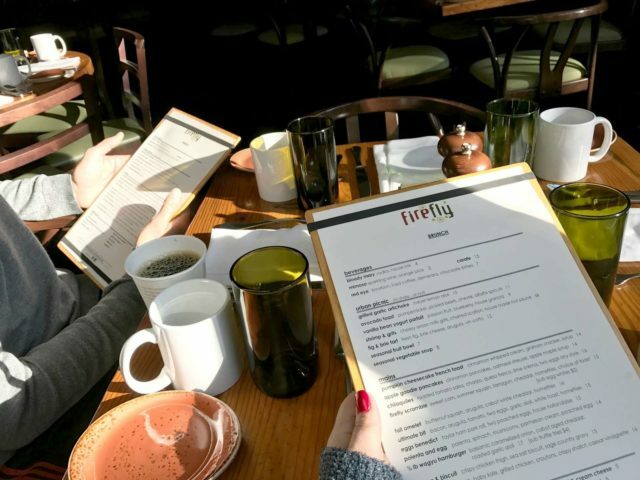 Firefly is a fantastic place for any meal, but they really excel for breakfast and brunch. There’s an entrance to the restaurant right from the hotel lobby, and since we’re early risers we had no problem scoring a table right near the window. Firefly is known for a giant tree in the middle of the restaurant; they continue this woodland theme with wood furniture, birch pillars, and green glasses that look as though they’re made from old wind bottles. The music was perfect too – a little Diana, a little Etta, a little Beyoncé. We ate there Saturday morning and it was so amazing and we had a hard time deciding what to choose we came back Sunday morning too. So nice we dined there twice! Do know as it gets later in the day Firefly gets more crowded but the relaxed vibe and good service never wavered. And how cute is the way they provide you with your check? 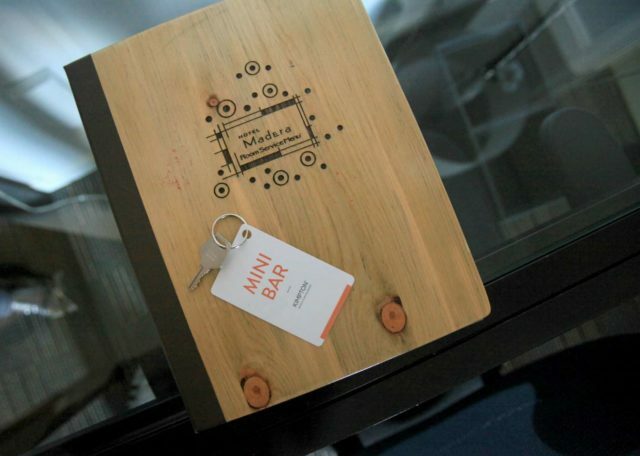 And for those staying at the Kimpton Madera, Firefly lets you charge your meals to your room. If you wish to step away from the hotel, there’s restaurants and cafes of all tastes and budgets within a comfortable walking distance. If you like Italian, Floriana is in an historic row house and their food is phenomenal. Karl took me to the Tabard Inn for my birthday a couple years ago; it’s a bunch of charming little rooms so you get an intimate experience. Pizza Paradiso is local chain of four locations, one in Dupont. Their pizzas are utterly delicious and they have a really extensive beer list. We love oysters and are fans of Hank’s Oyster Bar. 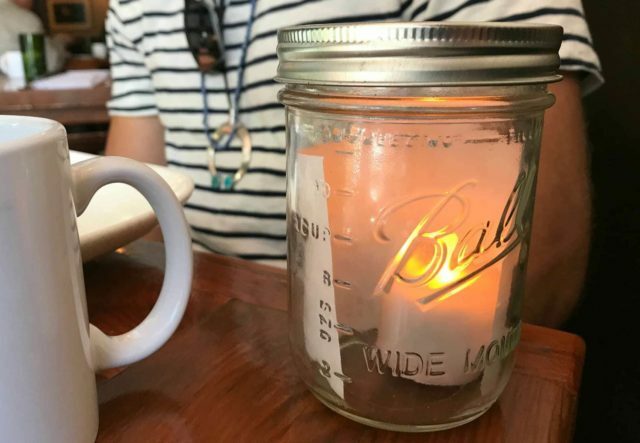 Emissary is a coffeehouse and bar but with a delicious farm-fresh menu for breakfast, lunch, and dinner. 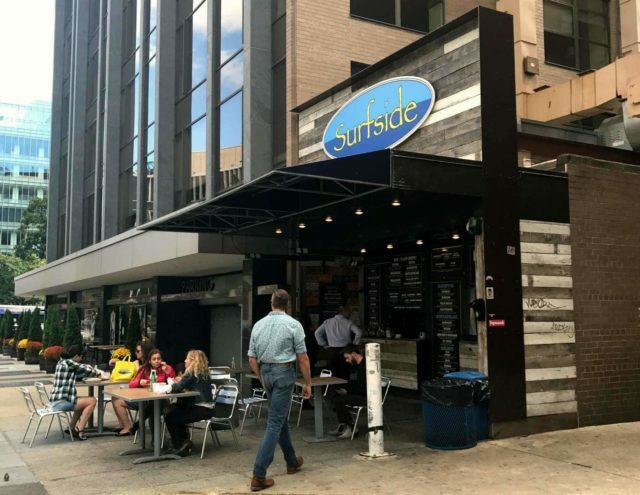 If you want a quick bite, check out Surfside, an Instagram-worthy taco stand that has outdoor seating but is just a block from the hotel so great for a to-go meal. 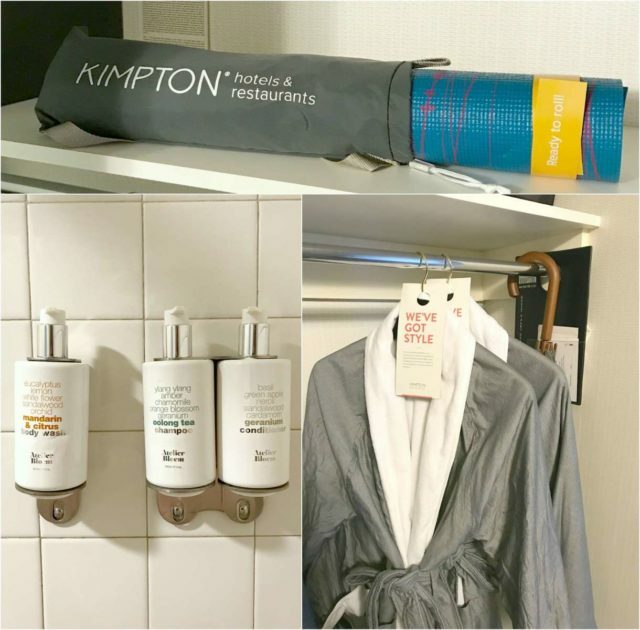 Kimpton hotels are known for their in-room amenities – stylish robes and wonderful extras like yoga mats, an umbrella, and large bottles of shampoo, conditioner, and body wash by Atelier Bloem. I have to say it was super cool to see the copy of Where magazine on the coffee table that had an article featuring me! I hadn't yet seen a paper copy and I hadn't even told Karl about the piece so it was a fun memento to take home with us. While Kimpton Madera doesn’t have a gym, all guests of the hotel have full access to the fitness center at Kimpton Hotel Palomar just two blocks away. The Palomar fitness center is super clean with new equipment and a view of their courtyard swimming pool. After burning off a few of the room service calories we took the long way home, window shopping and chatting about our memories of DC growing up. While we’ve been together since 12th grade, we still have a lot of stories not yet shared that take place in our Nation’s Capital! If spa treatments are what you desire during your getaway, Kimpton Madera has you covered. While we didn’t indulge, the hotel will coordinate for you in-room massages and various other spa treatments. And if you can’t imagine a weekend away without your pooch, Kimpton Madera is pet-friendly and will provide plenty of amenities such as pet beds, bowls, mats, and a list of pet-friendly restaurants and other businesses in the vicinity. Dupont Circle is a great destination for the local yokel or those from out of town. The famous Dupont Circle Fountain is just a short walk from the Madera and a place to hear live music, lie down in the grass, and People Watch. On Sundays visit the Dupont Circle Farmers Market where you can make a meal from the 50+ different vendors offering produce, meats, but also treats like coffee, sandwiches, crabcakes, and Chinese dumplings. Want to experience a speakeasy? Stop by The Sheppard (closed Sundays). Stop by Kramerbooks, one of my favorite places in the city for a book, some coffee, and possibly a political celebrity sighting. While the museums on The Mall are free, the Phillips Collection is a short walk from the Madera and is one of my favorites with a few O’Keeffes, Rothkos, and Renoir’s famous Luncheon of the Boating Party. I’ll be honest, we spent the majority of our weekend in our hotel room. We slept, we rented a movie, we ordered room service, we sat out on the balcony, we read, we connected as a couple free of a schedule or chores or an alarm to wake us up. 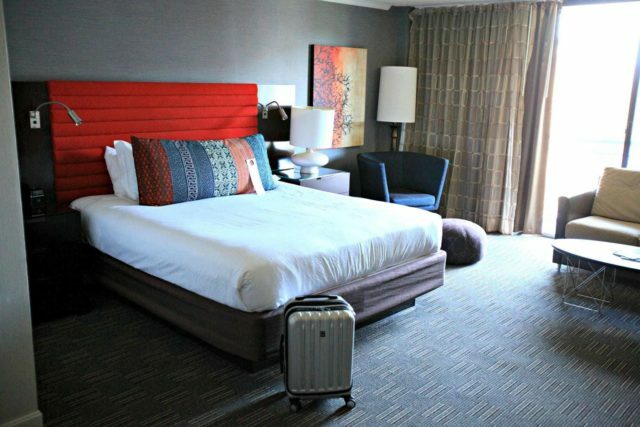 The Kimpton Madera staff was so friendly and helpful wanting to ensure we had the best experience on our terms. 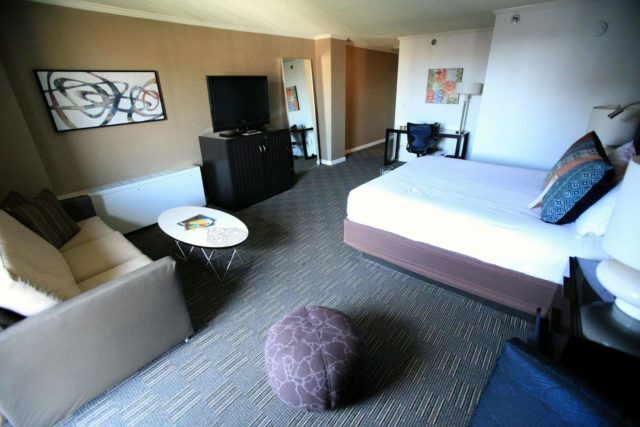 The room was so clean and comfortable, we could really relax and have a true staycation. Thank you Kimpton Madera for an amazing weekend. We’re relaxed, recharged, and cannot wait to visit again! I wanted to ask you what day Karl’s birthday is. It sounded like it might be the same as mine, Sept 28. Glad you had such a wonderful weekend. What is that tall, brown Victorian (?) building with the aqua roof? It looks interesting. If you ever want another staycation in DC, the Jefferson hotel is fabulous. It’s small but gorgeous. We did it for our 15th anniversary and I would do it again! I have herd fantastic things about the Jefferson, will have to check it out. Thank you for the suggestion!